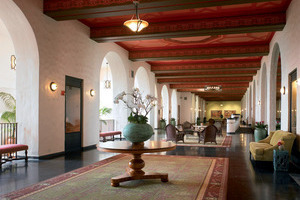 Situated looking out over the gorgeous splendour of the Waikiki beachfront, the Royal Hawaiian Resort is an iconic escape that helped usher in the new age of luxurious holiday experiences with its lavish designs, generously spacious settings and a level of service even the most discerning of travellers can appreciate. 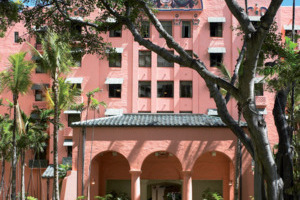 Aptly dubbed the “Pink Palace of the Pacific”, the resort lives up to its name by bringing a sense of royal elegance to all visitors, combining outstanding views with a sense of Hawaiian charm and history, essentially taking guests on a cultural journey as well as treating them to the usual holiday perks. Located right along the beachfront and housing a plethora of facilities, in-house dining venues and 528 accommodations to choose from, those looking to explore and those seeking to simply relax are in for a treat with this Hawaiian holiday haven. Enjoying its stunning vantage point overlooking the azure waters of the Waikiki beachfront, the Royal Hawaiian Resort serves as an iconic holiday haven where guests can ease back and relax beneath the golden sun and also delve deep into Hawaiian history. Boasting plenty of lavish designs, spacious settings and an attentive level of service, the affectionately titled “Pink Palace of the Pacific” set the stage for a new wave of luxury experiences, bringing forth a sense of royal elegance that all visitors can truly enjoy. Granting amazing access to the beachfront and surrounding highlights as well as being host to a wide range of soothing facilities, in-house dining venues and 528 intricately designed accommodations; the resort is everything a traveller could want and more when it comes to that memorable Hawaiian getaway. The Garden Guestroom offers guests a comfortable accommodation fitted with plush comforts, modern amenities and stylish decor throughout. The room features gorgeous views that overlook the Helumoa gardens. The Grove Guestroom offers guests a comfortable accommodation fitted with plush comforts, modern amenities and stylish decor throughout. 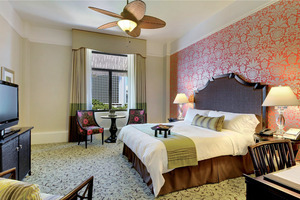 The room features gorgeous views that overlook the Coconut Grove gardens. The Historic Ocean Guestroom offers guests an elegantly designed accommodation that retains a sense of heritage and indigenous elements that combine with modern facilities to ensure traveller satisfaction. The room features gorgeous views that overlook the ocean. The Tower Ocean Guestroom offers guests a stunning accommodation beautifully fitted with lavish furnishings and modern, quality amenities peppered throughout, all drawing inspiration from the ocean and coral depths. The room features a private balcony that boasts of views of the ocean. The Garden Junior Suite offers guests a distinct accommodation that boasts of bold designs and intricate elements that come together to make a blissful setting surrounded by serene settings. The room boasts of views centred on the lush garden landscape. The Garden Suite offers guests a distinct accommodation that boasts of bold designs and intricate elements that come together to make a blissful setting surrounded by serene settings. The spacious room features a separate living area and boasts of views centred on the lush garden landscape. The Tower Loft Suite offers guests a contemporary accommodation elegantly furnished with plush comforts, stylish designs and a horde of amenities spread out over two storeys. The spacious suite features a living area and a private balcony that overlooks the pool and sparkling ocean. The Historic Ocean Junior Suite offers guests a classically designed accommodation fully fitted with modern furnishings all set throughout a space dedicated to heritage and tradition. The suite features a lounge area and boasts of views of the sparkling ocean. The Historic Ocean Suite offers guests a classically designed accommodation fully fitted with modern furnishings all set throughout a space dedicated to heritage and tradition. The spacious suite features a lounge area and boasts of views of the sparkling ocean. The Tower Ocean Suite offers guests a lavishly fitted accommodation that draws inspiration from the serene waters of the Pacific Ocean, complimented by authentic Hawaiian artwork. The spacious suite features a sitting area and a private balcony that showcases views of the ocean. The Queen Ka’ahumanu Suite offers guests a classic accommodation that grants an abundance of space, style and sumptuous perks, all enhanced by the plush pan-Asian comforts and elegant decor all throughout in a combination of East meets West. The suite features panoramic views overlooking the ocean. 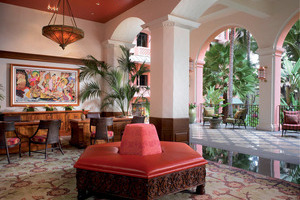 The King Kamehameha Suite offers guests an accommodation fit for royalty designed in hues of yellow and red to represent the Hawaiian monarchy followed by wooden koa and teak floors as well as authentic Hawaiian artwork. The suite features a spacious living area and a private balcony/lanai that showcases views of Diamond Head crater, Waikiki Beach and the Pacific Ocean. The Ali’i Suite offers guests a palatial accommodation designed specifically for an indulgent stay embraced by an abundance of luxury and style, all complimented by some of the most stunning views around. The suite features a dining area, a fully fitted kitchen, a living space and a private balcony/lanai whose views stretch from Diamond Head Crater across the sparkling Pacific Ocean to Barber's Point. The Royal Hawaiian Suite offers guests an opulent accommodation that serves as the ultimate experience when it comes to indulgence and luxury, with pink hues complimented by splashes of blue and silver to create a sense of sophistication and island elegance. The suite features a living area, a dining table and boasts of views of the surrounding Pacific Ocean. Azure Restaurant – Sample the mouth watering flavours of fresh seafood and fruits that culminate in extraordinary dishes worth waiting for. Surf Lanai Restaurant – Ease back and enjoy a casual dining experience where light lunches and hearty breakfasts are made up of American and island fare. Aha’Aina – Embark on a unique journey as tales of island royalty are accompanied by indulgent feasts for this momentous occasion. Mai Tai Bar – Gaze out at the sunset from this lounging bar with a refreshing cocktail or satiating the palate with an appetising snack.